We are called by Christ to “love one another” (John 13:34). As a Christian community we are summoned to respond to the needs of others. Our Pastoral Care ministries enable us to live out our core values of respect, service, hospitality and prayer by ministering to one another, offering comfort and refreshment in times of joy, sorrow, trial, transitions, or other need. Our pastoral care ministries are listed to the left. At any time, please contact us, should a need arise by either calling the office or sending a note here. Eucharistic Visitors take communion to and visit those who are unable to attend services at the church. Eucharistic visits are scheduled for the fourth Sunday of each month. Our EVs carry the parish with them as a sign of the whole community’s care, support, and concern for absent members. Pastoral Visitors are members of St. Luke's who visit those who often cannot attend services, providing a personal touch sharing the gifts of compassion and friendship. Pastoral Visitors have attended training to help them in their visits as Christian friends. The Pastoral Visitor visits at least once a month keeping a connection with St. Luke's. These visits usually provide a rich experience both for the Pastoral Visitor and the person visited. Stephen Ministers are laypeople – Christian men and women – trained to provide one-to-one care to people experiencing a difficult time in life, such as grief, divorce, job loss, chronic or terminal illness, relocation, or separation due to military deployment. The training Stephen Ministers receive equips them to provide high-quality care to people who are hurting. They are available to listen, care, encourage, and provide emotional and spiritual support. The caring relationship lasts as long as the person is in need of care. The Dame Julian Prayer Chain is made up of a dedicated group of parishioners from St. Luke’s. The official name is after Dame Julian of Norwich. It is also known as the Prayer Chain, or St. Luke’s Prayer Chain. These parishioners pray regularly for people whose names are submitted to the group, usually by people from the St. Luke’s community. The group is committed to confidentiality. Names can be given to anyone in the group by calling the parish office. The mission of the Knit One, Pray Too Prayer Shawl Ministry is to create prayer shawls for people needing the warm arms of care and concern wrapped around them. Our members knit or crochet shawls that are given to persons who are dealing with illness, grief or other types of crisis, as well as to expectant mothers. Baptismal shawls are presented in celebration of the occasion. The group also creates pocket prayer squares which have been sent to our soldiers serving overseas and given to other healing ministries. The Prayer Shawl ministry is open to all who like to knit or crochet. The group meets in the Alison Library every Monday at 9:30 A.M. September through May, and once a month June through August to work on shawls and pray for the recipients. The completed shawls are blessed on the first Sunday of each month at the 10:30 A.M. service. More than 675 shawls have been completed, blessed and presented to those in need of prayer. The group continues to present prayer shawls to the residents of Orchard Ridge (formerly Coeur d’Alene Homes) and Trinity Homes. Prayer shawls are also donated to Family Promise and Safe Passage (formerly North Idaho Violence Prevention Center). Daughters of the King is an international women’s group which strives to be an extension of Christ’s Kingdom through prayer, service and evangelism. DOK keeps an ongoing prayer list, provides prayer beads to anyone who wants them, and performs service activities at St. Luke’s. Service activities in which they participate include collecting school supplies for children at a local elementary school, preparing a home cooked meal for the Bike and Build youth and Family Promise, maintaining a used book shelf with profits benefiting the Safe Passage Center in Coeur d’Alene and working with our local Girl Scout troop decorating new socks for women and children in local shelters. Through our personal relationships with Christ, we strive to reach out to others through these loving acts and to proclaim our faith. 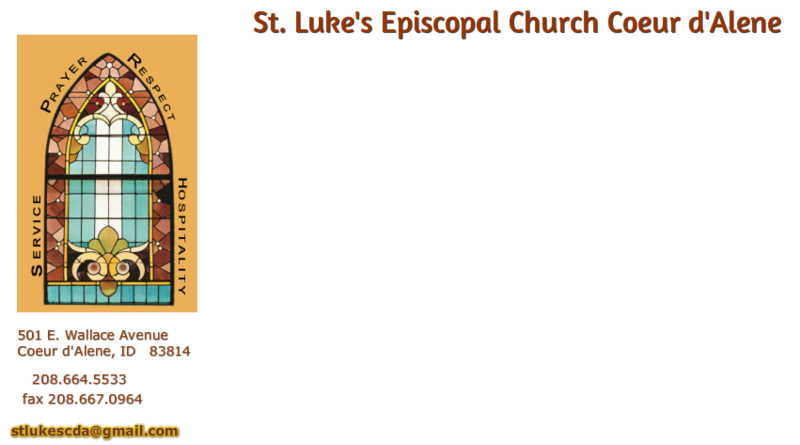 Membership is open to all Episcopal Church women and our local chapter at St. Luke’s gladly welcomes anyone who is interested. If you are a member of St. Luke’s, you are a member of Omega Guild. Omega Guild provides a caring, loving reception in the Parish Hall for family and friends to gather after a funeral or memorial service. The reception may be as simple as cookies and coffee or a full meal may be served - it’s the family’s choice to make. There is no expense to the family as the Omega Guild has a memorial fund which accepts donations, and it calls upon members to provide food and help as the need arises. St. Luke’s Columbarium is located between the main church and the Parish hall next to the ramp leading to the office. The Columbarium is being developed in phases and offers St. Luke’s families a final resting place for loved ones.